Lenovo Puts A New Spin On The ThinkPad Tablet PC: View Rotates To User. Screen Legible Outdoors. Controllable With A Fingertip. Lenovo has announced the ThinkPad X60 Tablet, a new convertible tablet PC marking a technology trifecta for innovation, portability and performance -- with two new screen choices and other innovative Lenovo features, such as dynamic screen rotation. Lenovo is the only PC maker in the 12-inch screen class of notebook PCs to offer the new, combined MultiView/MultiTouch screen features in a convertible tablet PC, giving users the power to compute more naturally, whether working in the field or in the office. The Lenovo ThinkPad X60 Tablet’s new 12-inch MultiView indoor/outdoor, anti-reflective/anti-glare display, dramatically helps increase viewability in multiple environments. 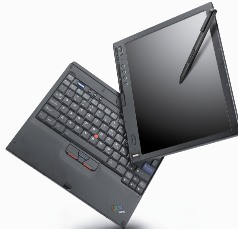 This screen choice comes combined with the new MultiTouch feature that allows users to move the cursor with their pen or finger, making interaction with the ThinkPad Tablet PC a natural fit. The MultiView/MultiTouch screen combination along with the ThinkPad X60 Tablet’s standard 170 degree viewing angle provides excellent portability and usability for the healthcare professional recording patient information in a hospital, the real estate agent taking notes in a home or the sports coach reviewing statistics at a game. The ThinkPad X60 Tablet also gives users sharp, crisp images with more vibrant color when they choose to add a new, high-resolution SXGA+ screen. According to IDC1, convertible tablet PC unit shipments will reach more than one million this year and more than four million by 2010, which means that more industries today are relying on tablet PCs. For Lenovo, tablet customers have included more and more mobile professionals in fields such as healthcare, insurance, real estate, government, education and sales. 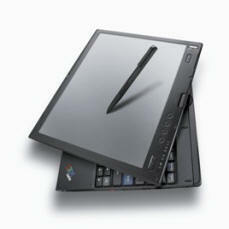 The ThinkPad X60 Tablets come equipped with Lenovo’s patent-pending Active Rotate function. With Active Rotate, the screen immediately orients to the user, no matter which direction it turns. The ThinkPad X60 Tablet’s design also focuses on improving more traditional tablet features like navigational tools and the pen. Now a redesigned navigational dial lets users move easily in four directions, and it even remaps keys so “up” is always “up” as the user changes orientation with Active Rotate. Also, a new, more natural and durable pen resumes from suspend mode automatically when a user removes it from its cradle. An enhanced digital microphone repositioned on the front bezel enables accurate voice recognition and rounds out the ThinkPad X60 Tablet’s sensory improvements. The ThinkPad X60 Tablet’s design also includes greater performance with more memory, a larger hard drive and longer battery life than Lenovo’s previous Tablet PC. The ThinkPad X60 Tablet also prepares people for the next generation of wireless connectivity with select models offering 802.11n technology2 as well as an embedded WWAN card. ThinkPad X60 Tablet users are also ready for the next operating system with many ThinkPad X60 Tablet models shipped Windows VistaTM Capable and some VistaTM Premium Ready. Pricing for the X60 Tablet starts at $1,799. The X60 Tablet will be available for shipping in early December with select models available immediately for pre-ordering. 1IDC, Worldwide PC Client Form Factor 2006-2010 Forecast, Doc# 202267, July 2006. 3Prices do not include tax or shipping and are subject to change without notice. Reseller prices may vary. Price does not include all advertised features. All offers subject to availability. Lenovo reserves the right to alter product offerings and specifications at any time without notice. Lenovo (HKSE: 992) (ADR: LNVGY) is dedicated to building the world's best engineered personal computers. Lenovo's business model is built on innovation, operational efficiency and customer satisfaction as well as a focus on investment in emerging markets. Formed by Lenovo Group's acquisition of the former IBM Personal Computing Division, the company develops, manufactures and markets reliable high-quality, secure and easy-to-use technology products and services worldwide. Lenovo has major research centers in Yamato, Japan; Beijing, Shanghai and Shenzhen, China; and Raleigh, North Carolina. For more information, see www.lenovo.com/us/en. Performance features are loaded into ThinkPad X41 Tablet notebooks. Designed as part of the industry-leading X40 Series, the ThinkPad X41 Tablet is the smallest and lightest 12” convertible tablet, for the ultimate mobility in a choice of versatile ultraportables. This model has the ability to function both as a tablet and an ultraportable notebook, providing the flexibility to take handwritten notes directly on the screen with the Tablet Digitizer Pen. Starting at only 3.5 lb.2, the Tablet also features up to 6.3 hours6 of battery life, providing the longest standard battery life of any 12” convertible tablet (select models). Impressive features — including the Intel® Pentium® M processor on select models, a full-size keyboard11, Intel 915GM Express Chipset, PCI Express Integrated Graphics, one Secure Digital card slot, and one PC Card slot — give you outstanding performance in a small and light convertible Tablet. Write on the screen or type usingthe legendary ThinkPad keyboard. With a full complement of ports and slots,this tablet has the flexibility you need. Share common accessories and docking solutions with ThinkPad X40 and X41 notebooks. Introducing the smallest and lightest 12"convertible tablet. It starts at only 28.96mm 1 (1.14") and 1.61kg 2 (3.5 lb). Integrated Fingerprint Reader and Embedded Security Subsystem on select models combine to create the most secure tablet available. No other manufacturer offers stronger security as a standard feature. keyboard,portability,docking, accessories or screen size. Manager and the ThinkVantage ™ Embedded Security Subsystem to authenticate with a fingerprint and a single password instead of multiple passwords. Administrators can also take advantage of the Reader to implement strong security policies and to help users more easily meet ongoing password requirements. inside for ThinkVantage Technologies and ThinkVantage Design elements. You ’ll see how to work more confidently and efficiently —and gain more time to focus on strategic goals. The ThinkPad X41 Tablet provides full tablet and notebook functionality without sacrificing battery life, keyboard, portability, docking, accessories or screen size. Select ThinkPad X41 Tablets feature an Integrated Fingerprint Reader that can combine with Password Manager and the ThinkVantage ™ Embedded Security Subsystem to authenticate with a fingerprint and a single password instead of multiple passwords.Administrators can also take advantage of the Reader to implement strong security policies and to help users more easily meet ongoing password requirements. Security software is preloaded for more out-of-the-box convenience. To help decrease expenses, look inside for ThinkVantage Technologies and ThinkVantage Design elements. You ’ll see how to work more confidently and efficiently —and gain more time to focus on strategic goals. Deploy the most secure wireless ultraportable tablets in the industry with a bi-directional Integrated Fingerprint Reader, the Embedded Security Subsystem 2.0 and built-in Wi- Fi wireless. They offer built-in hardwareand preloaded software-based protection. No other manufacturer offers stronger security as a standard feature. Support your mobile workforce with ThinkPad X41 Tablets and ThinkVantage Access Connections software. It ’s the easiest way to switch between wired and wireless networks. Improve signal reception with the ThinkVantage UltraConnect ™Antenna. To maximize range, this antenna is built into the display of ThinkPad X41 Tablets. Plus, it supports multiple frequencies to optimize coverage. Brace yourself. Like airbag technology, the ThinkVantage Active Protection System features built-in motion sensors. When a fall is detected, the hard disk drive temporarily parks itself. That makes it less likely that data on your hard disk drive will be lost because of some bumps or drops. Put online 6 and on-system information at your employees’ finger tips with Blue button. With the push of a button, staff can gain answers to common IT questions by themselves. Type more comfortably and efficiently with the full-size keyboard —a big advantage on an ultraportable. Give your help desk a break. Meet ThinkVantage Rescue and Recovery™ software. It ’s preloaded on ThinkPad X41 Tablets. With this enhanced, one-button solution, staff can restore system images themselves in the event of a software crash —often without a call to the help desk. THE ULTIMATE SECURITY AT YOUR FINGERTIPS “The increased focus on system security for regulatory purposes leads us to predict that today’s PC password standards will no longer be accepted in 2008,” according to the November 2004 Gartner Research Note, “Treat Passwords as Ineffective on PCs." The report goes on to recommend that organizations requiring strong data protection should consider, among other things, trusted platform module (TPM)–enabled systems and, for systems subject to Sarbanes-Oxley controls, tokens or biometrics.